It has been a rather dynamic week for both bitcoin, and tether respectively. The prior weekend saw strong volume across all USDT pairs on Poloniex, hopefully we will see this repeat coming into the pre-fork weekend. Tether bottomed out at a new monthly low of 1,835 USDT on June 16, the current weekly low is slightly above that at 1922.19 USDT. Volume had been stable after the run-up to the current trading range, and was showing signs of waning, until the last 2 red hourly bars appeared. Regardless, this is somewhat expected given the prior rise, and is in most cases, common during the middle of the week. If price holds above the 2,548.48 USDT support, and volume begins to increase, we could see another move higher, into what may turn out to be open air trading-wise. This would result in a break past the 2,977 USDT all-time high, which would understandably be perceived as highly bullish, ideally right before weekend trading begins. Fibonacci level extensions derived from the pre all-time high trading range, in ascending order, are set at 3,323.01 USDT (fib 1.236), 3,537.57 USDT (fib 1.382), 3,710.98 USDT (fib 1.5), and 3,884.38 USDT (1.618). All are potential price points moving forward, in case price shoots past confirmed resistance levels at 2,817.94 USDT, 2,879.74 USDT, 2,907.40 USDT, beyond the 2,924.69 USDT weekly high, and lastly, ahead of the all-time high at 2,977 USDT. We may witness a bearish MA crossover soon, the 30-day MA appears to be lagging in comparison to the 200-day MA, which is in a steady rise. Close supports are holding for now at 2,599.99 USDT and 2,549.79 USDT, despite the shattering of the previous 2,649.76 USDT support. 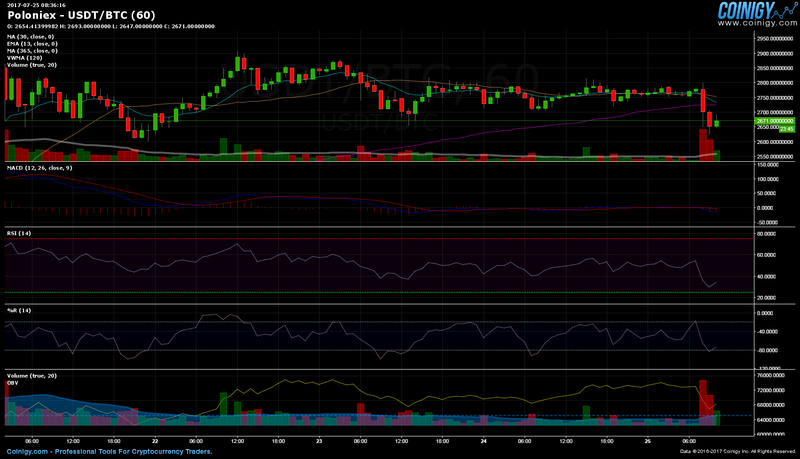 Price has dropped below the lower Bollinger band, bearish momentum confirmed for the short term at least. Bands are expanding, which is frequently an early signal for incoming volatility. Nonetheless, further trading activity is required for increased certainty. 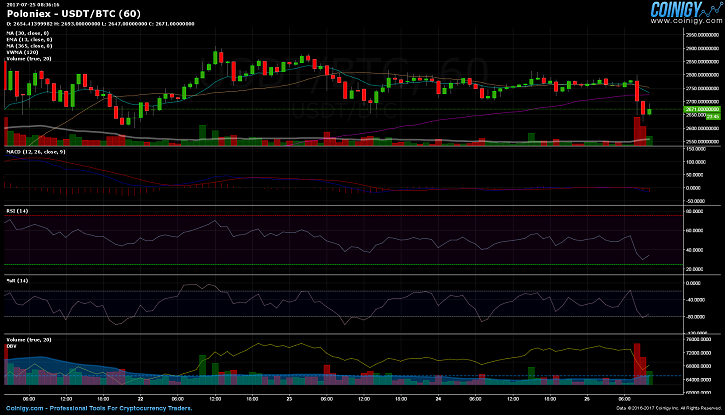 RSI is oversold at the moment, but seems to be following the existing price trend and overall market movement. No lasting or substantial divergence with the Williams %R indicator, which is also mirroring RSI performance at present. The same is true for the MACD, no immediate or obvious divergence in relation to the total market trading or price fluctuations. 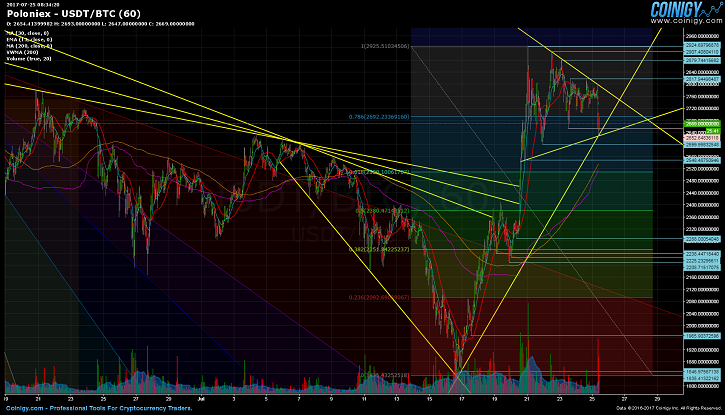 OBV has dropped rapidly with the increase in short term sell volume, bearish sign for now. Poloniex’s bitcoin/tether pair started trading on July 16 at 1,835 USDT (10:00 GMT). What began as a strong move up, lasted until 2,387.17 USDT was touched on July 18 (20:00 GMT), after which price oscillated between 2,211 USDT and 2,408.73 USDT, before soaring yet again to the new weekly high of 2,924.69 USDT on July 20 (22:00 GMT). Trading has since continued in a fixed range, between the still valid 2,599.72 USDT support, and aforementioned weekly high. If you have any questions or comments concerning bitcoin, please feel free to use the form below to reply or comment.